New Year's Eve just isn't the same with kids. Now we just do our best to stay up until midnight! This year we wanted to make it little bit of a bigger deal so we invited some friends and made some fancy drinks. You can see Richie helped mix up some special concoctions and Regina stayed up late as well (under the plate of beef skewers!). Thanks to Zido, Doug, Lisa, Shumway and Joanna (and baby Carly) for coming over to celebrate the new year with us. It wasn't a wild party, but we got to spend some time with good friends (and some fireworks from the roof). Chris and Rich got their first day out on the slopes this year during the Christmas break. I wanted no part because it was going to be so cold and crowded, but as soon as they left I felt so jealous. A bad day of skiing is still better than a good day at work, right? You can see the pics I received while I was sitting in my office. A big boy lunch at the top of the mountain and riding the gondola all the way to the top. I guess Chris had to talk Rich out of one more run because he was absolutely exhausted. 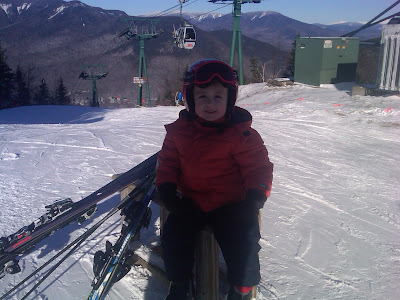 We are so happy he likes skiing and he is more and more like his Dad every day! For a middle of break treat we got 13 tickets to see Disney on Ice with lots of our friends!! It is always more fun when it is a big group.We just can't say no when it is down the street and I can get super cheap tickets from NEAD. Although Peter Pan was in this one, it wasn't the kids favorite. As Danny said, "too much kissy, kissy!" We also realized that these boys love sports so much we really need to take them to the Sports Museum in the Garden some time. Another day.....but you can see four of Tim Thomas' favorite fans. Colton, Angela,Gracie, Richie, Brayden, Riley, Danny and Emily! After all of the presents were opened we went to Jim and Karen's for a wonderful Christmas dinner. It is always nice to go there because we get to see at least a couple of Karen's sisters and their family. Here are some of our family Christmas pics. The day had finally come and it seems everyone had been good this year! Richie got new skies and the Beyblades and umbrella he wanted. He also got a signed picture of Tim Thomas holding the Stanley Cup. Angela got her Dora Scooter, a big girl clock and a new hat she kept on all day. We bought the kids a karaoke machine which was also a hit and already has had a lot of use. Also, Uncle Eddie and Kevin got another new flat screen TV. THIS time we hope they use it upstairs. And the "big" boys all got the hockey jerseys they wanted. I know Christmas isn't about the presents, but it is hard to say it isn't a big part for the kids. The look on the their faces is priceless! I do feel like they love spending so much time with family, but they also work hard to be good to get the new toys they want. Christmas Eve dinner was at my Mom's house this year so we did some cooking and then enjoyed the company. Theckla, Ron and Joanne made all of their usual feast of the fishes food which we enjoyed with Uncle Eddie and Kevin who came to celebrate with us as well. After stuffing our faces we put cookies, milk and carrots out for Santa and the reindeer and went to bed. The most exciting night of the year! Richie decided that he wanted to "make" his very own Elfie to have all year round. He drew a picture of him and started telling me how he was going to do this. I immediately realized this was 100% NOT a project for me so we send Babci the picture with some instructions. I am not sure how I am her daughter because when we got to Monroe she had all of the supplies Rich would need to make his elf. It took them hours (maybe even more than one day), but after a lot of work (and a lot of Babci's patience) Richie now has his very own stuffed Elfie. He has slept with it every night since they made it and loves it to pieces! At Thanksgiving time I realized that cousins Colleen and Sean were probably going to be in the NJ area around the holidays. Well it worked out that we got to see them AND meet their new baby Maggie. I am SO glad because I don't think I could have waited until the summer to meet this cutie pie. I stole SO much play and snuggle time and fell in love with this munchkin. The kids got to play with cousins Natalie, Nicholas and Mara so it was a fun family day. These pictures aren't great of poor baby Maggie, but trust me she is gorgeous! And a big smile from cousin Mara at the end. Because Richie's school is just busting at the seems, they went looking for a bigger place to hold their December Assembly. This is the bigger one where all of the kids "perform" and lots of parents go. After looking into some of the local colleges, etc someone had the bright idea to go to the Peter Pan Tent. Well lucky enough for us, they said YES so the kids were able to perform on the 360 degree stage that has been home to the Peter Pan performance the past few months. We had seen the show so we knew how AWESOME this was going to be. Richie was ecstatic although also nervous and asked if Peter Pan was going to be there. No worries I took LOTS of pics and videos as you can see. Since the kids didn't go near Santa this year Richie knew he better make a list if he was going to have any chance of getting what he wanted. If you can't read it it says Richard wants Beyblades and a #30 Bruins jersey (Tim Thomas) and Angela wants a Dora scooter. Then he remembered he also wanted a Batman umbrella with a hook for a handle (no other one would do!). Poor Angela being the second child again doesn't get to do as many activities as Richie did. He started this music class when he was just a few months old with Nana Mary. Well Angela is over 2, but I was still determined to make sure she could say she went to Family Music Makers as well. The funny thing is that she LOVES it (probably more than he ever did!) which makes me so sad we didn't do it earlier. Oh well. 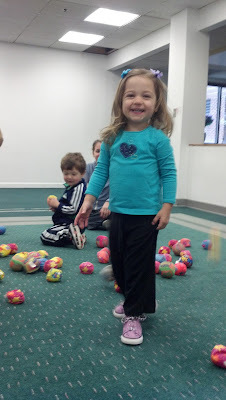 Here is Angela and her big smiles at music class. I already signed her up for the next session AND for music class at day care. Starting to feel a little less guilty! The kids are lucky that they still get to see their Dawnie so we had to do a special Christmas dinner with her and exchange presents. As you can see she never fails to get the kids everything they want. I think Angela even picked out the outfit she got. Can you say SPOILED!!! Needless to say we love our Dawnie and are so glad she is still in our lives. ....yes Richie has pants on...OK maybe shorts. I have no idea why!! Things went downhill as soon as he could get into his drawers. Because he wears a uniform to school he often comes home and "changes" into other clothes. You just never know what it is going to be. My library group was lucky enough to raise money to have Wayne Martin Puppets come and perform. We had seen him at Christopher Columbus park so we knew this was an event not to miss. Our friends Haley and Elin came as well. Angela is obsessed with Haley so she was in heaven. AND she didn't have to share Haley with her brother. As you can see below, even baby Elin really got into the show. Richie saw a commercial for the Christmas Spectacular and fell in love with the Rockettes! Lucky for us our friends Maddie and Parker wanted to go as well so we made a special Mommy/kid night of it in our Christmas best. The show was even better than I remembered and perfect for kids. Lucky kids going to the Wang Theater at 4 years old! I hope we do this again and I cannot wait to take Angela. A new holiday tradition?? Before my work holiday party got underway the kids (Gayle's daughter Jennifer as well) did some coloring. The kids got along so well and even continued to color while we went out to the atrium for the party. I will have to get the rest of the pics. Chocolate fountain, gingerbread cookie decorating and a magician! It was a fun party. I can't believe it, but my baby is in preschool! Yep, she already moved up a class at her day care. She has been telling us she didn't want to go, but when the morning came, she was all smiles by the time I left. So happy to finally not have tears so I can take her school pic. They made play-doh and went on the big kid playground. Sounds like fun to me......although I had a sad day thinking how my baby was gone. So glad she was safe and happy, but I want my baby back!